This post is brought to you by FiAir, which provided advertising support. For charcoal grill owners, the necessary first step for any grill session (and on every favorite recipe) is to light the charcoal. . . and then wait. Wait for the ideal glowing coals that finish perfectly white, their delicious smoky scent wafting through the air. If you’re like us, the wait time leaves you wishing for a magical instrument you could use to speed the process along. Short of a genie to grant your wish, there are few inexpensive, easy-to-use tools that will aid you in your quest to speed up the charcoal lighting process. Enter FiAir, a handheld blower that will shorten ready time to 8-12 minutes. This simple, battery-operated equipment will save you valuable charcoal prep time, and have your meal ready faster than ever before. FiAir taps into a natural fuel for fire: air. The portable device circulates air over the coals and “feeds” them to ensure they heat faster naturally. You can use FiAir for more than just coaxing lit coals to life: accelerate hot spots, rapidly increase cooking temperature for a quick sear, spread flames to evenly consume fuel, and stoke waning fires as new fuel is added. You can even create a blazing wood fire in 2 minutes! 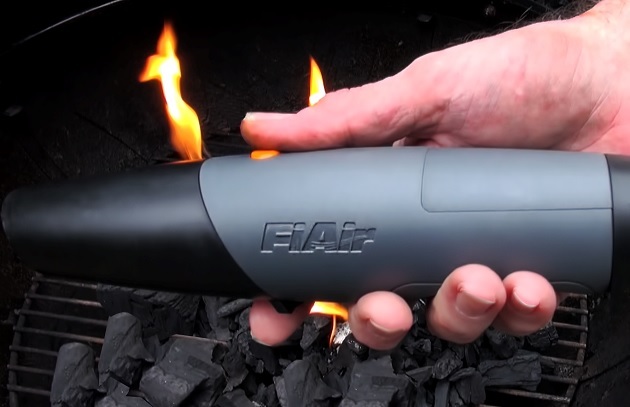 Sure you can manage your grill without a blower like FiAir, but do you really want to? Learn more about FiAir in our store.